Priors are an important part of the Bayesian prediction process. By default, Insight will use "equal priors", where the prior probabilities of the lithofluids are equal. If good knowledge of the geology is available, results may be more accurate by including a Prior Model in the prediction process. This allows a priori information to be included in the prediction (e.g. a prediction interval has a higher likelihood of containing brine sand than shale). 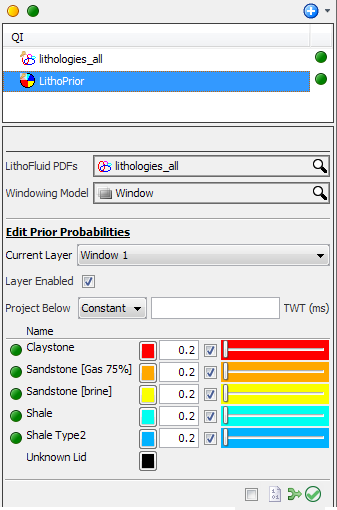 Prior models are applied as part of the Lithofluids process (see Lithofluid Probability) and can be visually inspected using the Predict window (see Using the Predict Window). In the Control Panel, open the QI tab. At the tab header, click on the Add icon and select Add Prior Model. In the Details Panel, select a LithoFluid PDF (see Importing a LithoFluid PDF). At Windowing Model, a windowing model can be used, instead of a sculpted volume, to define a series of bounded time/depth windows. Alternatively, select to use the Whole Trace. Under the Edit Prior Probabilities section, choose which window to edit at Current Layer. This is based on the windowing model that you have chosen. Select the Layer Enabled check box to enable layers.When creating your priors, each layer in the windowing model can be selected independently, and different prior probabilities set. At Project Above/Below, select to use a constant or a horizon, or both, to define the maximum/minimum extent above/below which data will not be displayed. The lithofluids will be displayed in a table at the bottom of the Details Panel. Click on the green/amber circle to the left of the name to hide/show the items. You can change the colour of the lithofluids by clicking on the colourbar and picking a different colour. Type the ratio of the lithofluid in the box or use the slider to adjust the values. Click on the check box to normalise the ratio. To enable normalisation of all lithofluids, click on the check box at the bottom. To save the values, click on the Copy as XML to clipboard icon at the bottom and paste it in a file. If the ratio does not add up to 1, the icon at the bottom right will be red with an exclamation mark to indicate a warning. Click on the Give even value to all enabled fields icon to adjust the normalised ratios to even values. When all the ratios add up to 1, the circle will turn green with a tick to indicate that values are valid.